Monash University was established in 1958. Since the first students began their studies at the foundation campus in 1961, Monash has grown to become Australia’s largest university, enrolling more than 62,000 students. Monash has an ever-growing global alumni network, today totalling more than 270,000 graduates. There are six Australian campuses, international campuses in Malaysia and South Africa, an education and research centre in Italy, a joint-research academy with the Indian Institute of Technology in Mumbai, and the Southeast University-Monash University Joint Graduate School (Suzhou, China). Monash is ranked in the top one percent of world universities according to the Times Higher Education World University Rankings 2013-2014, and is one of only seven Australian universities in the top 150 of the Academic Rankings of World Universities 2014 by the Center for World-Class Universities at Shanghai Jiao Tong University. The Australian arm of BioEYES is run through the Faculty of Medicine, Nursing and Health Sciences, specifically via the School of Biomedical Science and the Australian Regenerative Medicine Institute (ARMI). 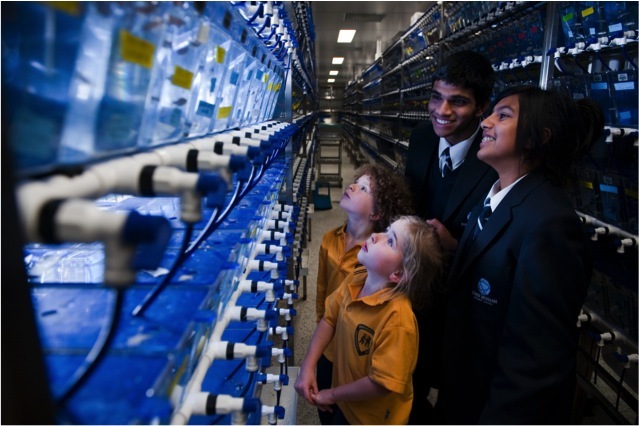 The zebrafish facility at Monash University, home of BioEYES Australia. ARMI is a globally-oriented research organisation of excellence committed to revolutionary discoveries and therapeutic strategies that lead to restoring health and normal function, repairing damaged tissues and regenerating the aging body. The School of Biomedical Science houses some of the world's leading experts on research into cancer, cardiovascular disease, development and stem cells, drug discovery, immunology and infection, metabolism and obesity, neuroscience, and structural biology. Together, School of Biomedical Science and ARMI work to uphold Monash University’s commitment to outstanding education, through undergraduate and postgraduate degrees, and more recently though our outreach education via BioEYES. For more information about the BioEYES program at Monash, please email med-bioeyes@monash.edu.